Johannes Kirchmayer, also known as John Kirchmayer, was born March 31, 1860, in Oberammergau, Bavaria. Oberammergau is known for its Passion Play, something the whole town participates in every year it is performed. As a young man, Kirchmayer had the role of Joseph (of many-colored-coat fame) in the play. “We have the statement from John, himself, that the ‘Passion Play’ was a great influence in his early life.” (Prouty, p. 18). It meant Kirchmayer was well versed in biblical history, which would serve him well later in life. The village of Oberammergau is also known for its long tradition of woodcarving. After he learned to carve from his grandfather, and later his Uncle Georg, a professional carver, Kirchmayer spent a number of years taking classes in Augsburg and Munich, Germany, and in London and Paris perfecting his craft. In 1880, at the age of 20, Kirchmayer moved to Boston, Massachusetts. There, he found work creating mantels, stairways, home decorations, and furniture. However, his greatest passion seems to have been ecclesiastical works, perhaps influenced by the Oberammergau Passion Plays of his youth. Kirchmayer’s friend Stanford White, an architect, introduced him to a number of other architects. He soon found work with cabinetmaking and decorating firms that were working on commissions in churches, businesses, institutions, and private homes. Kirchmayer had close working relations with a number of prominent architects and artisans and was, in 1907, a founding member of the Society of Arts and Crafts, Boston. After 1898, working for the Boston furniture and architectural woodworking firm Irving and Casson, Kirchmayer worked on the buildings of the noted American Gothic-revivalist Ralph Adams Cram, a prolific architect of collegiate and ecclesiastical buildings. Kirchmayer’s notable work around Boston include carvings in The Church of the Advent; All Saints’ Church; the Second Church; and Unity Church. He also designed part of the Anderson Memorial Bridge over the Charles River. 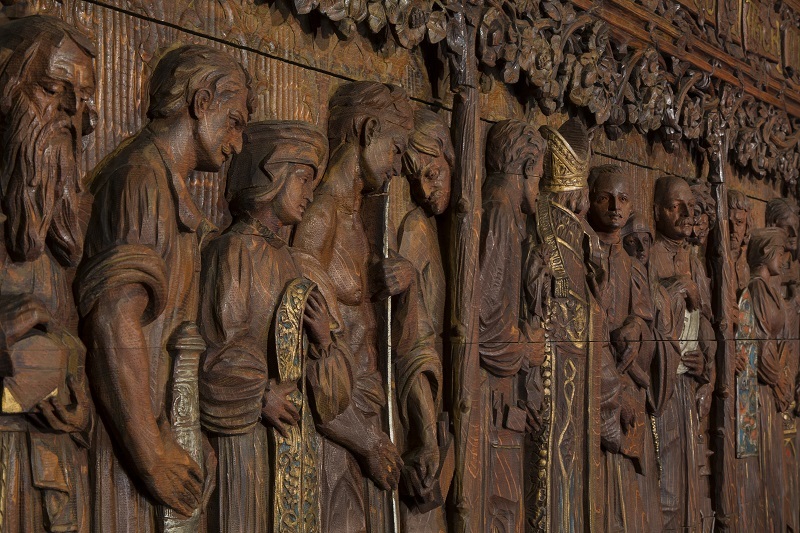 His work outside the Boston area includes carvings in Christ Church Cathedral, Springfield, MA; the Church of Saint Mary the Virgin, West 46th Street, New York City; St. Mary’s Anglican Church, Windsor, Ontario; the Church of the Saviour, Syracuse, New York; and the James J. Hill House, St. Paul, Minnesota. 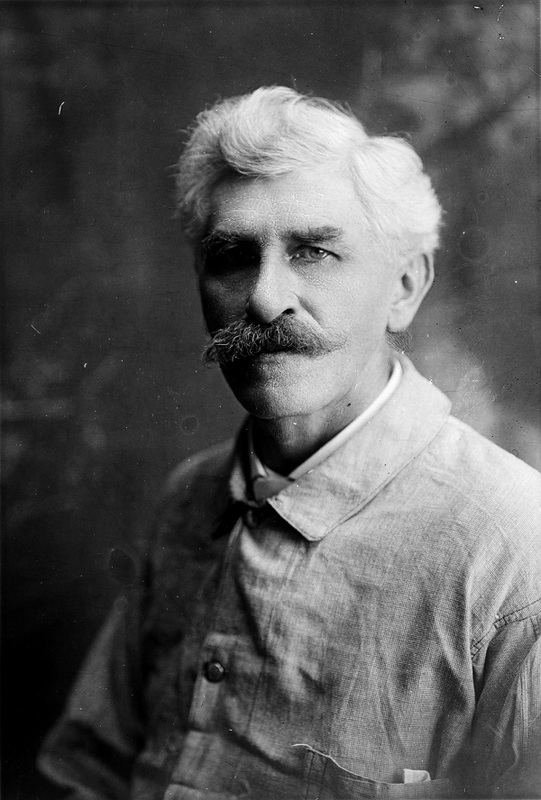 George G. Booth made Kirchmayer’s acquaintance through their Arts and Crafts activities and soon became one of his most ardent patrons. 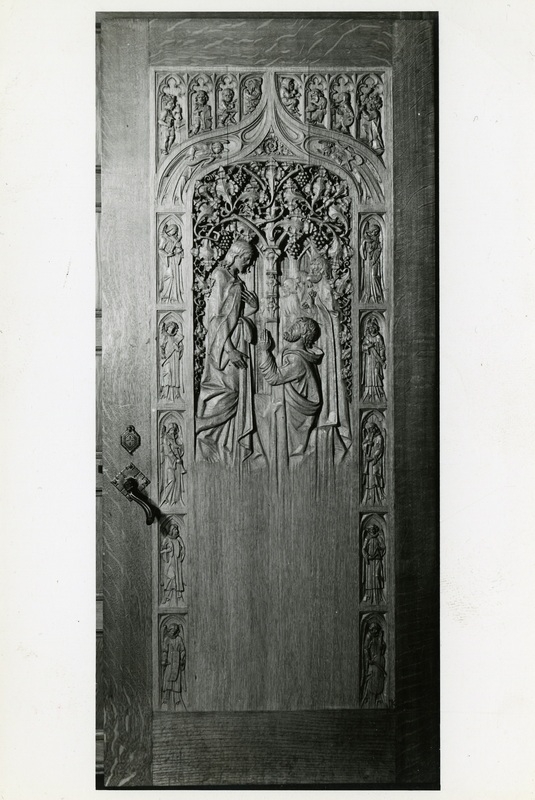 Booth commissioned Kirchmayer to produce carvings for Christ Church Cranbrook, Cranbrook House, and the Booth Collection of decorative arts at the Detroit Museum of Art. 1918 carved portrait of George G. Booth, in Cranbrook House Library, by Kirchmayer. Courtesy Cranbrook Center for Collections and Research. It is said that Kirchmayer “put his heart and soul into each Madonna, saint, commoner, or angel he was carving.” (Prouty, p. 29). He also followed the old Bavarian custom of leaving one’s visage somewhere in your work. At Christ Church Cranbrook, Kirchmayer’s works include the “Doubting Thomas Door,” which features images of the craftsmen who worked on the church, including Kirchmayer; the ornamental screen covering the wall at the back above high altar with “Triumphant Christ” at the top; the Lectern; the Chapel Doors and Lectern in the Resurrection Chapel; and a Madonna in Parish House. “Doubting Thomas Door,” Christ Church Cranbrook. Courtesy Cranbrook Archives. Kirchmayer left his visage as the woodcarver on the “Doubting Thomas Door”. Courtesy Cranbrook Archives. At Brookside School, Kirchmayer created corbels (projections jutting out from a wall) of the four Evangelists. Corbel representing St. John the Evangelist at Brookside School. Courtesy Cranbrook Center for Collections and Research. At Cranbrook House, Kirchmayer carved many works. 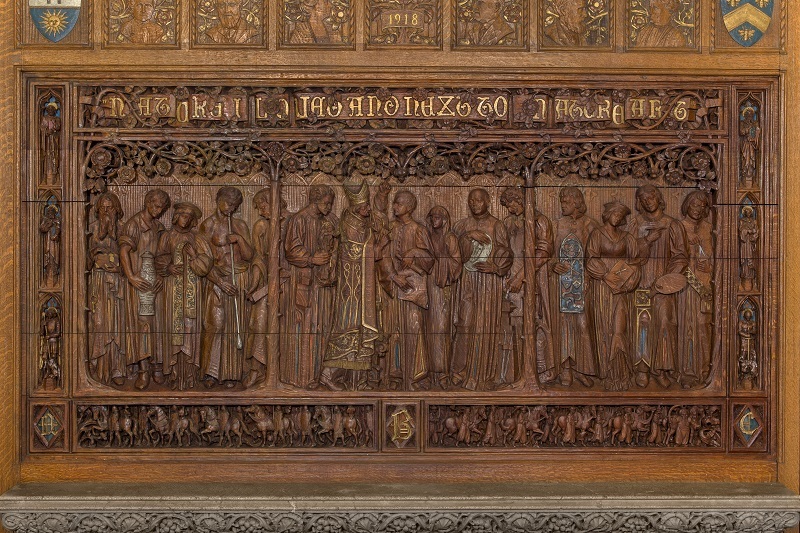 The largest commission was the impressive paneling of the Library, including the “Personification of the Arts (Religion Inspiring the Arts)” overmantel, which featured Kirchmayer as the woodcarver. Kirchmayer’s “Personification of the Arts (Religion Inspiring the Arts)”over-mantel in Cranbrook House Library. Photograph by P.D. Rearick, Courtesy Cranbrook Center for Collections and Research. Detail of Kirchmayer’s “Personification of the Arts (Religion Inspiring the Arts)” over-mantel in Cranbrook House Library. 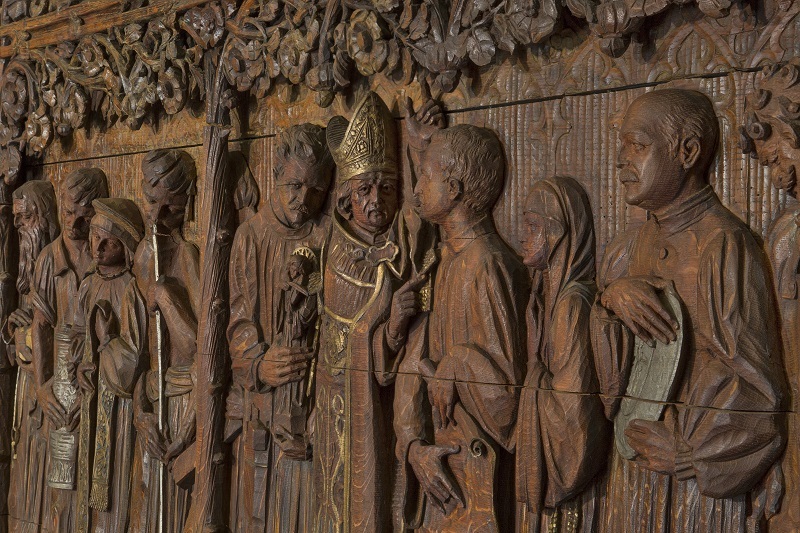 Note that the woodcarver (behind the bishop) is depicted as Kirchmayer himself. Photograph by P.D. Rearick, Courtesy Cranbrook Center for Collections and Research. Detail of Kirchmayer’s “Personification of the Arts (Religion Inspiring the Arts)” over-mantel in Cranbrook House Library. Photograph by P.D. Rearick, Courtesy Cranbrook Center for Collections and Research. He also created items like a reading desk and bench; linen-fold paneling in Oak Room; a blanket chest; four carved Gothic finials in the corners of the Library; and a small figure of himself for the Booths. George G. Booth particularly enjoyed his reading desk and bench, which Kirchmayer created for the Booths’ library in 1919 from a sketch that Booth had supplied. (Prouty, p 100). 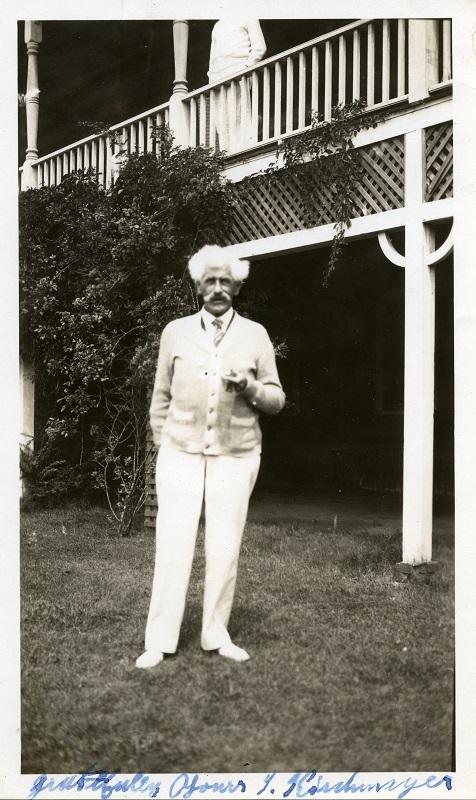 Snapshot of Johannes Kirchmayer in front of the New Silver Beach Hotel in North Falmouth, MA, circa 1928. Courtesy Cranbrook Archives. Kirchmayer’s work can be found in many prominent cities: from Minneapolis-St Paul, to Detroit, Chicago, Pittsburgh, Columbus and Quincy, Ohio, Baltimore, Washington D.C., New Haven, New York City, Providence, Boston, Concord and Peterborough, New Hampshire, Portland, Maine, as well as in The American Church in Manila and in Walkerville, Ontario, Canada. Perhaps his prolific work across the globe is the reason why, shortly before his death, Kirchmayer received the “Craftsmanship Medal for Distinguished Achievement in Wood Carving” by the American Institute of Architects. It is the only time the award has been given for woodcarving. Johannes Kirchmayer died at his Cambridge, Massachusetts home in 1930. LESLIE, EXCELLENT ARTICLE, BRINGS BACK MEMORIES OF GUIDING CRANBROOK HOUSE TOURS AND TELLING THE STORY ABOUT ALL THE KIRCHMAYER PIECES AT THE HOUSE. I knew nothing of the background. Thank you! I wish this had been sent before the Reunion weekend!